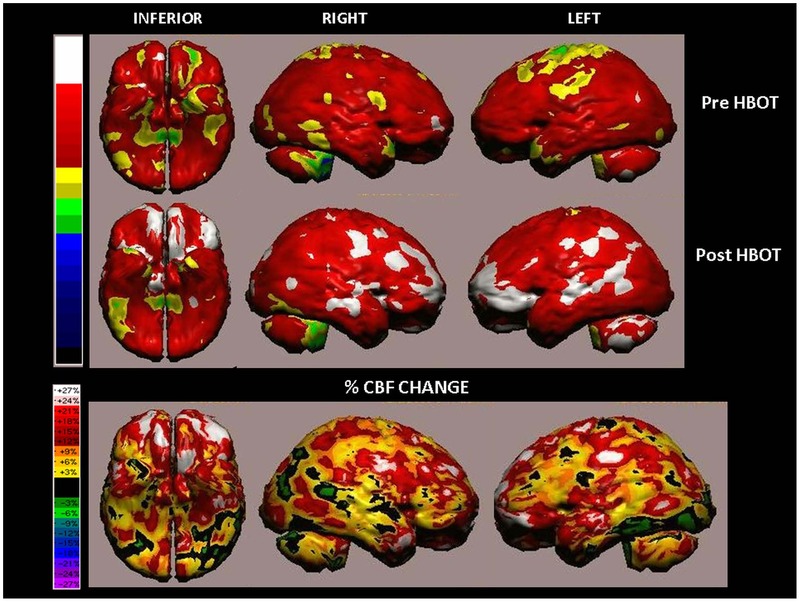 This graphic shows a patient’s brain before HBOT (first/top row of scans), Post HBOT (second row of scans) and then shows the % change of oxygen flow to the brain (third/bottom row of scans). 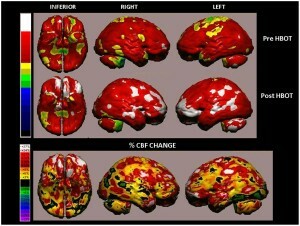 The third/bottom image provides an excellent view of increased oxygen flow to the brain after HBOT therapy as represented by the yellow, red and white areas (please refer to the key directly to the left of the image). If Oxygen flow promotes healing by reducing inflammation, this image shows how HBOT can be an effective treatment for traumatic brain injury and post concussive syndrome. Number of HBOT treatments differ with conditions. Acute conditions may require from as little as 1-10 treatments, while chronic conditions could require a larger number of treatments over a longer period of time. At a practice level, Innovative Hyperbaric Solutions reports that 70% of patients experience relief of concussive symptoms after HBOT allowing them to return to normal activity. Typically, patients report an improvement in symptoms within 2-5 treatments. The following information found on HBOT.com provides testimonial about a student athlete who suffered a severe concussion while playing lacrosse. 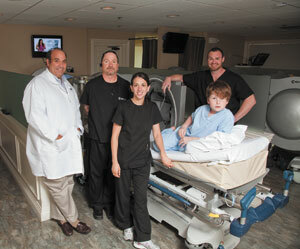 After receiving HBOT treatments, his vision, balance, memory, and headaches improved dramatically. For more information about results from clinical studies and review articles, visit our Resources page with links to .pdf files and websites. © 2015 Innovative Hyperbaric Solutions. All Rights Reserved.